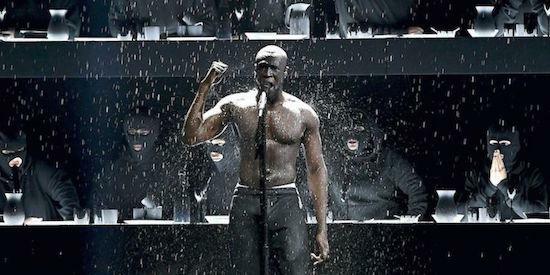 Closing the BRIT Awards last night, Stormzy took aim at Theresa May and the Daily Mail in addressing the fire last year at Grenfell Tower that killed 71 people. Sharing a new freestyle, he asked: "Theresa May, where’s the money for Grenfell? What, you thought we just forgot about Grenfell / you criminals / and you got the cheek to call us savages/ you should do some jail time / you should pay some damages / we should burn your house down and see if you can manage this." Jessica Elgot, a political correspondent at The Guardian, has now tweeted that Downing Street has responded to Stormzy's performance. "Number 10 says £58.29m has been committed to Grenfell survivors, rehousing and community," her tweet says, noting that the statement has been issued in direct response to his freestyle. "If there are concerns about distributing of funds, govt will listen, spox says, but has accepted initial response to fire was too slow." Stormzy took home two awards at the BRITs last night, for Best British Male and Best British Album for his 2017 album Gang Signs and Prayer.